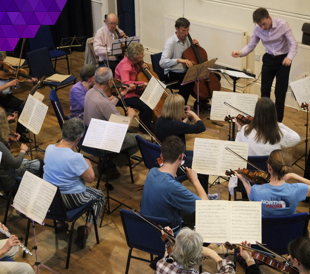 The Otley Chamber Orchestra was founded in 2009 by a small group of keen local musicians who wanted to provide an opportunity for themselves and others to enjoy orchestral music-making. We have now grown to a group of 40 – 50 committed players who meet fortnightly at the Otley Courthouse Arts Centre. The emphasis is on enjoying playing the Classical and early Romantic repertoire,and also some early 20th century works. Once a year we give a public concert in the Methodist Hall in Boroughgate, Otley. Chris Pelly is a conductor, pianist, trumpeter and singer. He started conducting Otley Chamber Orchestra on an occasional basis in 2014 and became our Musical Director in June 2016. 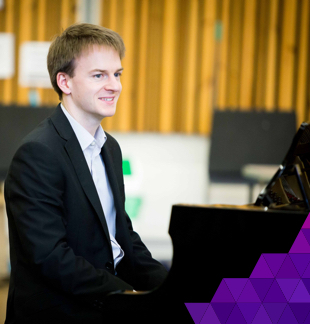 He studied Music at the University of Leeds and now arranges their International Concert Season. He is the Musical Director of the Leeds Haydn Players and Mirfield Choral Society, and also regularly conducts the West Yorkshire Symphony Orchestra. Chris Hodges joined Otley Chamber Orchestra as Leader in 2011. He has played the violin in more than 20 orchestras acting as Leader in several of them. He is a scientist working for the University of Leeds. Our concert will be on the 19th May (7:30pm). We will have extra rehearsal on 24th March (10am – 4pm). Rehearsal on concert day will be at Wesley Hall (4pm). Free parking is available at the car park adjacent to the venue. There are currently a few vacancies for brass and percussionists and string players (Grade 6 and above). Our woodwind section is currently full but we keep a Waiting List (Grade 8 and above) and do try to give those players a chance when the regular players are away. If you are interested in joining, please contact our Secretary Helen Thornton using the details below.